Posted: Thursday, January 14, 2016. 7:46 pm CST. 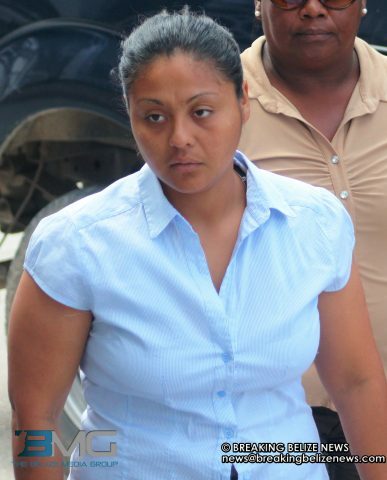 By Aaron Humes: Coast Guard officer Keyren Tzib was back in the Magistrate’s Court today and has been told that she will face a preliminary inquiry in February for a manslaughter charge in the death of common-law husband Thytis Blancaneaux. Tzib, represented by Darrell Bradley, will return to court on February 5, 2016 before Chief Magistrate Ann-Marie Smith. The young officer avoided a charge for murder after convincing police and the office of the Director of Public Prosecutions that she had no intention of killing Blancaneaux. She alleged that she stabbed him after he reportedly repeatedly hit her with a piece of bamboo. The stabbing had occurred at the young couple’s Lord’s Bank home, following an afternoon of drinking and a heated argument and shortly after that Tzib produced a knife and stabbed Blancaneaux. Today she received disclosure for the case and Chief Magistrate Smith requested that Bradley give his written submission to the court on or before the date of the inquiry. As for Tzib’s other serious charge of attempted murder for her fellow coast guard colleague, Kurt Hyde in April of 2015, the court prosecutor reported that Tzib’s case file remains at the DPP’s office and police have not received it back yet. Both cases were adjourned for February 5, 2015. Tzib made bail on the attempted murder, but it was revoked after she was charged for manslaughter. She applied again on the second charge but was initially rebuffed in the Supreme Court due to concerns over her mental state. After completing counselling and a course of medication while in prison, Tzib was successful in securing bail on December 23, 2015.